So, I have mentioned a few times already about starting a sketch book and creating work that is not for anything in particular. I am struggling with it to be honest and haven't got very far - but I am still determined to do it. I am hoping as I start winding down client work before maternity leave that might afford me a bit more time to experiment. Anyway I am rambling - the other day I stumbled across sketch book pages on Oliver Jeffers website and it got me so inspired (you should also check out the rest of of his work - I am in awe - I also can't wait until our kid is old enough to read books so that I can buy ALL of the kids books he has illustrated!). How amazing is the picture below. There is something so satisfying about a big fat messy sketchbook. Don't you just want to be able to feel it in your hands and look through it? The sketchbook below was actually a part of a project called BOOK which included 3 other artists and involved them sending the sketchbook back and forth between them (across the Atlantic no less) and each contributing pages over the course of 36 weeks. In this post are some of the pages that Oliver Jeffers created for the BOOK project but also some from other sketchbooks that he has included on his website. 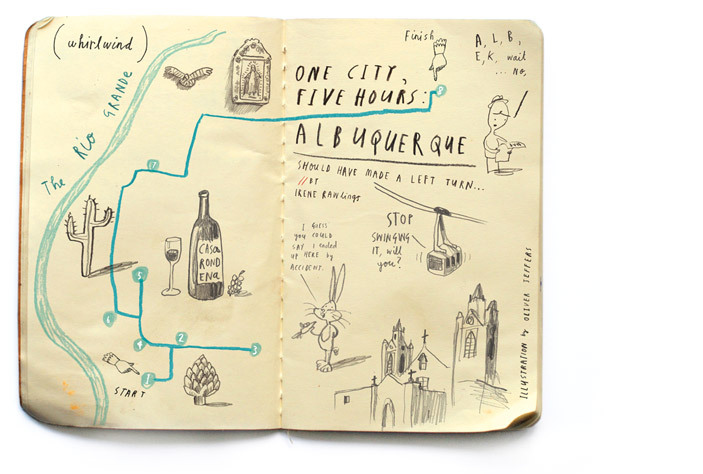 I love that Jeffers seems to use lots of different materials in his sketchbooks. It is not just about drawing and sketching in the traditional sense - there is a really fun and playful nature about the pages which I guess matches his illustrative style. It feels like he is experimenting and trying things out and the results are a thing of beauty. I have so many scraps of paper and ephemera that I have collected that would be perfect for using in my sketchbook experiments. I just need to get started! Using all sorts of different scraps of paper and techniques Jeffers creates so much texture in his sketchbooks. I hope that these pages have inspired you as much as they have me. I am really hopefully that it won't be too long before I can share some experimental pages of my own and give you a bit more of a behind the scenes of my creative experiments. I have the sketchbooks and the tools and now it is just a case of getting started and being a bit more disciplined with it instead of just talking about it!